On the third day of Joe, XOXO gave to thee…two Joes for the price of one! Here’s Joe with his cardboard standup (love how he’s taller than his cardboard twin!). Which do you like better…Laughing Joe or Fierce Joe? I don’t know about you, but this is the best advent calendar I’ve ever had! 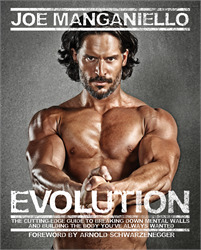 Remember, we’re finishing up our 12 Days of Manganiello with a fantastic giveaway, including signed copies of Joe’s book, EVOLUTION, DVDs of True Blood and Magic Mike, and other goodies. The sweepstakes goes live on December 16, so be sure to come back and enter for a chance to win. Though two Joes could be fun I would want the real thing cause I know it would be way more exciting.